The secret to brewed ice tea is in the quality of the tea leaves because cooling it down strengthens the tea’s distinctive flavor. In preparing tea, always try to use fresh (preferably filtered) cold water if possible. 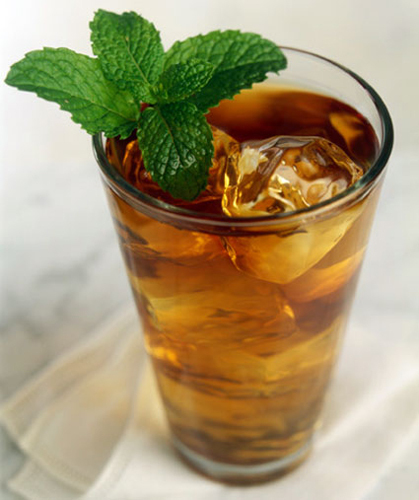 Iced tea is very versatile and can be made unsweetened and then flavored and sweetened to taste. If you’re planning on using tea bags, use 4 tea bags. Tie the strings of the tea bags together to create a tidy little tea bundle, and place them into the pitcher. If you’re using loose leaf tea, measure out 4 teaspoons of tea into a tea filter of your choice. In a pinch, you can use a coffee filter and tie it with a string. Bring two cups of the water to a boil, and pour them over the teabags into the pitcher. Steep the pitcher for 20 minutes or more, which creates the tea concentrate. Avoid putting the hot pitcher into your refrigerator to avoid creating a health hazard. Hot items in the fridge can heat up the surrounding air and create opportunities for fresh food to decay. Remove and discard the tea bags. Be careful not to break them while you’re doing this. Fill the pitcher with a mix of cold water and ice cubes, and refrigerate before serving. To serve, pour the tea over iced cubes, stir in sugar and a squeeze of lemon. The type of tea for iced tea depends on taste, but typically is orange pekoe or another form of black tea. Green tea works great as well. If you enjoy floral teas, we recommend experimenting with one or two bags of these teas mixed in with black tea.